Light from a background galaxy is warped around a foreground galaxy, forming a spectacular view through a gravitational lens. Albert Einstein's vision for how gravity works was, to say the least, a radical departure from the older, Newtonian perspective. Under Einstein's framework, the space-time coordinate system that we use to mark out the events of our universe isn't just a static backdrop, but a fully dynamic, live creature in its own right. Space-time can bend, flex and warp under the influence of mass and energy, and it's this rugged geometry that gives us the force of gravity. And nothing knows how the difficulty of that terrain better than light itself. Forced to follow every hill, valley, bump and wrinkle in the universe, light's path is constantly jostled back and forth as it tries, in vain, to follow a straight and narrow path. The presence of a nearby massive object will deflect light from its original path. Even though the photon, the carrier of light and the electromagnetic force, has no mass of its own, the influence of gravity is universal. Once that space-time terrain is shaped, everything in the universe must work to navigate the geometry. By pure coincidence, the base of a typical wineglass is a good approximation to the gravitational lensing behavior of a simple, (relatively) small, spherical object like a star. If you look through a (hopefully empty) wineglass at the room around you — and you may want to do this sober so it makes more sense — you'll see a very distorted picture. If you point the wine glass straight at an object, you'll see the object stretched into a ring surrounding the center of the glass's base. In less extreme cases, you'll see arcs or the same image repeated on multiple sides of the base. When we look deep into the universe, sometimes we come across a chance alignment. Something truly massive, like a giant cluster of galaxies, will lie in front of many unassociated background galaxies. The light from the distant background must follow the twisted and warped gravitational path set by the cluster, and the result is a curiously beautiful set of images. Like looking through a giant wine glass, we'll see multiple images of the same galaxy, bent in long thin arcs, odd blobs and sometimes even perfect rings. These warped and distorted images give us important clues about the contents of the cluster — the massive object between us and the background that's providing enough gravity to make a decent lens. By comparing the grotesque images of the galaxies behind the cluster to normal galaxy images, we can build a fairly reliable estimate of the mass of the big cluster. We can even estimate how that mass is distributed within the cluster. This method provides another key piece of evidence for the existence of dark matter. That's because the effect is totally independent of other approaches to measuring cluster mass, like galactic rotation curves and galaxy cluster gas temperatures. Take away the presence of dark matter, and the bending path of light from background galaxies around clusters wouldn’t be nearly as severe as we see it to be. It's not just through big, fat clusters that we get useful cosmological information. At the opposite end of the spectrum from the strong lenses are the, you guessed it, weak lenses. 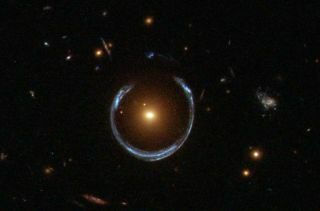 By definition, everything in the universe can act like a gravitational lens; your observational technique just has to be sensitive enough to detect the lensing. As light flies to us from the distant reaches of the universe, it filters through near and around any intervening sources of mass. If you took only a quick glance at any random distant galaxy — especially not one that's stuck behind a big cluster — it won't look any different than a nearby galaxy. But it will be different, if only minutely. A slight tweak here. A small distortion over there. Perhaps a mild elongation or bending. These effects are too small to see in any one galaxy, but if you analyze thousands, better yet millions of galaxies across the universe, you can reconstruct the distribution of matter between us and those galaxies. Taken to the extreme, we can do this with the cosmic microwave background, the light from the early universe that has been filtering through the coffee grounds of our cosmos for 13.8 billion years. We have been able to use incredibly tiny deformations in that image to complete an even bigger project: reconstructing the distribution of matter in the entire universe between us and that background light. But that's just a single image, giving us the total bending that the light has experienced in its journey through the history of the universe. To make a 3D map, we need to repeat this process using a series of concentric shells of galaxies surrounding us, carefully mapping the minute distortions in their images and noting the differences in adjacent shells. That technique, known as weak gravitational lensing, is in its relative infancy but quickly gaining steam. It's currently used extensively in cosmological surveys like the Dark Energy Survey, and in (hopefully) upcoming missions like WFIRST, to map out the growth and evolution of structure in our universe — providing another window into the hidden realms of dark matter and dark energy. There's one more major application of lensing that I need to mention. At the top, we have the strong lenses, like giant clusters of galaxies, able to noticeably warp the image of a galaxy. Below that, we have weak lensing, which can be detected through careful statistical analysis. Below that, we get the class of so-called microlenses, which are too small to even cause a visible distortion. Instead, when a small object like a black hole or brown dwarf passes in front of a distant star by chance alignment, we see a momentary increase in brightness due to the lensing around the interloper. While this occurrence is very rare indeed, if you stare at enough stars long enough, you're bound to see it happen. And when you do, you can catch all the lonesome wanderers of our galactic landscape that aren't otherwise visible. You can also spot planets. When a star itself is the interloper, if it carries any planets in orbit around it, they will change — ever so slightly — the momentary brightness during the microlensing event. From the largest to the smallest scales, our universe is full of twinkling, glittering lenses. And just like the glass lenses that sit inside our telescopes and microscopes, these cosmic lenses give us views into parts of our universe that would otherwise be too difficult to see. Learn more by listening to the episode "How Does Gravity Make a Lens?" on the "Ask a Spaceman" podcast, available on iTunes and on the web at http://www.askaspaceman.com. Thanks to @JanelleDuncan, Jack S., William H., Straw W. and Don M. for the questions that led to this piece! Ask your own question on Twitter using #AskASpaceman or by following Paul @PaulMattSutter and facebook.com/PaulMattSutter. Follow us @Spacedotcom, Facebook and Google+. Original article on Space.com.